Die Veneris, 22 Julii, 1642. Jewel for E. of Ormond. ORDERED, That Somersetshire shall have the like Order concerning the Advancing the Propositions for Bringing in of Horse, Money, and Plate, as Bucks: And that the Names of the Persons now presented, shall be the Persons intrusted with this Service. Mr. 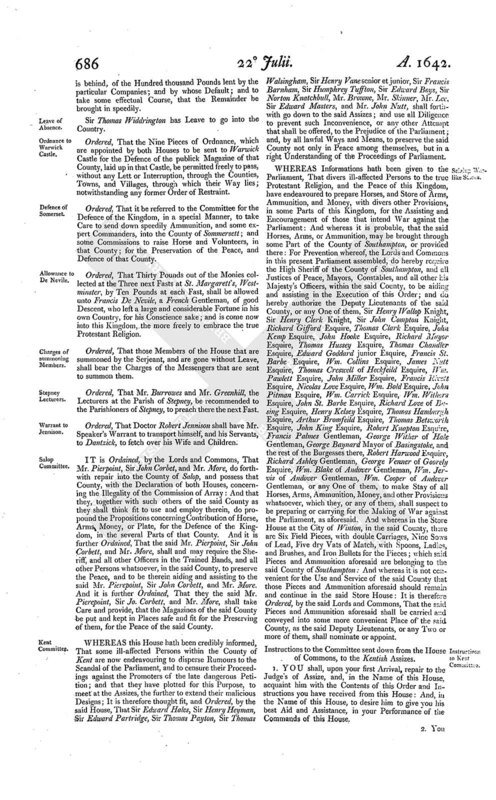 Solicitor reports the Earl of Pembroke's Bill, with One Amendment; viz. the Words "Spiritual and Temporal," to be left out; The which was put to the Question, and assented unto; and agreed, upon the Question, that the like Amendment should be made upon * * *. The Lords commanded us to let you know, that the Lord Mayor is attending, to expect his Trial; and the Lords expect, that some Members of this House should be there present, to manage the Evidence at his Trial. Ordered, That the Pamphlet, intituled, " Animadversions upon some Notes set forth by the Observators upon, &c." be referred to the Committee for Printing. The House hath considered your Message; and hath resolved to send some Members presently, to manage the Evidence. Mr. Cromwell brings Answer, That the Lords will send Answer to the Letter to the Lord Esmond, by Messengers of their own. Ordered, Sir Jo. Stoell, Sir Jo. Pawlett, Mr. Smyth, Sir Nicolas Stoury, Sir Bevill Greenevile, Sir Edw. Rodney, Sir Jo. Strangewayes, Sir Gerard Napier, Mr. Rogers, Mr. Rose, Mr. Jo. Coventry, Mr. Kirkeby, Mr. Strangeways, Serjeant Hide, Mr. Edw. Philips, be forthwith summoned * * * *. Ordered, That the Knight of the Shire, Sir H. Heyman, and the rest of the Gentlemen of the County of Kent, do take Care, and use their best Endeavour, that the Judge in his Circuit do publish the Order of both Houses, concerning the Commission of Array. A Message from the Lords, by Sir Ro. Riche and Dr. Heath. The Lords have sent down the Letter; to the which they have agreed, with One Amendment: The which was read, and assented. Mr. Ro. Goodwyn has Leave to go into the Country to the Assizes in Sussex; and to stay for a Fortnight. Ordered, That the Gentlemen that are appointed to go to the Assizes in Kent, do presently withdraw, to prepare some Instructions for the better Enabling them to do Service there. 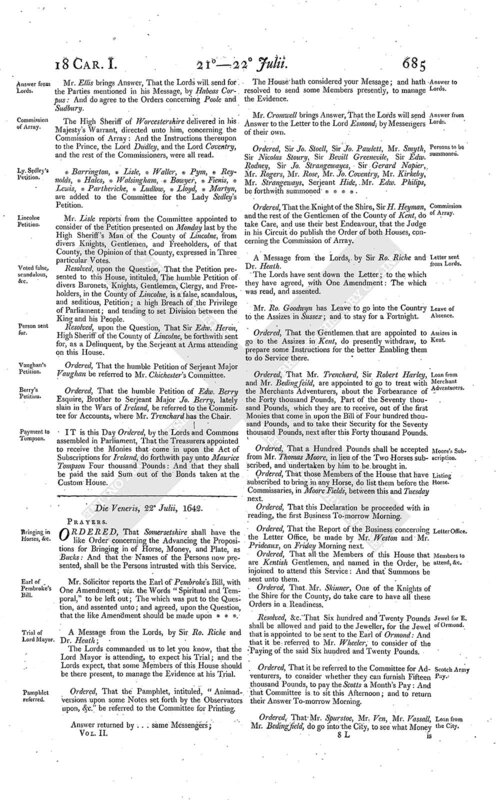 Ordered, That Mr. Trenchard, Sir Robert Harley, and Mr. Beding feild, are appointed to go to treat with the Merchants Adventurers, about the Forbearance of the Forty thousand Pounds, Part of the Seventy thousand Pounds, which they are to receive, out of the first Monies that come in upon the Bill of Four hundred thousand Pounds, and to take their Security for the Seventy thousand Pounds, next after this Forty thousand Pounds. Ordered, That a Hundred Pounds shall be accepted from Mr. Thomas Moore, in lieu of the Two Horses subscribed, and undertaken by him to be brought in. Ordered, That those Members of the House that have subscribed to bring in any Horse, do list them before the Commissaries, in Moore Fields, between this and Tuesday next. Ordered, That this Declaration be proceeded with in reading, the first Business To-morrow Morning. Ordered, That the Report of the Business concerning the Letter Office, be made by Mr. Weston and Mr. Prideaux, on Friday Morning next. Ordered, That all the Members of this House that are Kentish Gentlemen, and named in the Order, be injoined to attend this Service: And that Summons be sent unto them. Ordered, That Mr. Skinner, One of the Knights of the Shire for the County, do take care to have all these Orders in a Readiness. Resolved, &c. That Six hundred and Twenty Pounds shall be allowed and paid to the Jeweller, for the Jewel that is appointed to be sent to the Earl of Ormond: And that it be referred to Mr. Wheeler, to consider of the Paying of the said Six hundred and Twenty Pounds. Ordered, That it be referred to the Committee for Adventurers, to consider whether they can furnish Fifteen thousand Pounds, to pay the Scotts a Month's Pay: And that Committee is to sit this Afternoon; and to return their Answer To-morrow Morning. Ordered, That Mr. Spurstoe, Mr. Ven, Mr. Vassall, Mr. Bedingfield, do go into the City, to see what Money is behind, of the Hundred thousand Pounds lent by the particular Companies; and by whose Default; and to take some effectual Course, that the Remainder be brought in speedily. Sir Thomas Widdrington has Leave to go into the Country. Ordered, That the Nine Pieces of Ordnance, which are appointed by both Houses to be sent to Warwick Castle for the Defence of the publick Magazine of that County, laid up in that Castle, be permitted freely to pass, without any Lett or Interruption, through the Counties, Towns, and Villages, through which their Way lies; notwithstanding any former Order of Restraint. Ordered, That it be referred to the Committee for the Defence of the Kingdom, in a special Manner, to take Care to send down speedily Ammunition, and some expert Commanders, into the County of Sommersett; and some Commissions to raise Horse and Volunteers, in that County; for the Preservation of the Peace, and Defence of that County. Ordered, That Thirty Pounds out of the Monies collected at the Three next Fasts at St. Margarett's, Westminster, by Ten Pounds at each Fast, shall be allowed unto Francis De Nevile, a French Gentleman, of good Descent, who left a large and considerable Fortune in his own Country, for his Conscience sake; and is come now into this Kingdom, the more freely to embrace the true Protestant Religion. Ordered, That those Members of the House that are summoned by the Serjeant, and are gone without Leave, shall bear the Charges of the Messengers that are sent to summon them. Ordered, That Mr. Burrowes and Mr. Greenhill, the Lecturers at the Parish of Stepney, be recommended to the Parishioners of Stepney, to preach there the next Fast. Ordered, That Doctor Robert Jennison shall have Mr. Speaker's Warrant to transport himself, and his Servants, to Dantzick, to fetch over his Wife and Children. 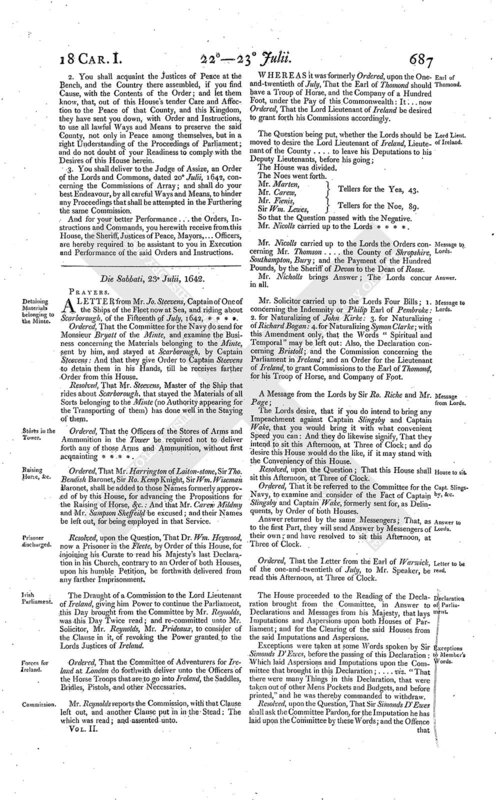 IT is Ordained, by the Lords and Commons, That Mr. Pierpoint, Sir John Corbet, and Mr. More, do forthwith repair into the County of Salop, and possess that County, with the Declaration of both Houses, concerning the Illegality of the Commission of Array: And that they, together with such others of the said County as they shall think fit to use and employ therein, do propound the Propositions concerning Contribution of Horse, Arms Money, or Plate, for the Defence of the Kingdom, in the several Parts of that County. And it is further Ordained, That the said Mr. Pierpoint, Sir John Corbett, and Mr. More, shall and may require the Sheriff, and all other Officers in the Trained Bands, and all other Persons whatsoever, in the said County, to preserve the Peace, and to be therein aiding and assisting to the said Mr. Pierepoint, Sir John Corbett, and Mr. More. And it is further Ordained, That they the said Mr. Pierepoint, Sir Jo. Corbett, and Mr. More, shall take Care and provide, that the Magazines of the said County be put and kept in Places safe and fit for the Preserving of them, for the Peace of the said County. WHEREAS this House hath been credibly informed, That some ill-affected Persons within the County of Kent are now endeavouring to disperse Rumours to the Scandal of the Parliament, and to censure their Proceedings against the Promoters of the late dangerous Petition; and that they have plotted for this Purpose, to meet at the Assizes, the further to extend their malicious Designs; It is therefore thought fit, and Ordered, by the said House, That Sir Edward Hales, Sir Henry Heyman, Sir Edward Partridge, Sir Thomas Payton, Sir Thomas Walsingham, Sir Henry Vane senior et junior, Sir Francis Barnham, Sir Humphrey Tuffton, Sir Edward Boys, Sir Norton Knatchbull, Mr. Browne, Mr. Skinner, Mr. Lee, Sir Edward Masters, and Mr. John Nutt, shall forthwith go down to the said Assizes; and use all Diligence to prevent such Inconvenience, or any other Attempt that shall be offered, to the Prejudice of the Parliament; and, by all lawful Ways and Means, to preserve the said County not only in Peace among themselves, but in a right Understanding of the Proceedings of Parliament. WHEREAS Informations hath been given to the Parliament, That divers ill-affected Persons to the true Protestant Religion, and the Peace of this Kingdom, have endeavoured to prepare Horses, and Store of Arms, Ammunition, and Money, with divers other Provisions, in some Parts of this Kingdom, for the Assisting and Encouragement of those that intend War against the Parliament: And whereas it is probable, that the said Horses, Arms, or Ammunition, may be brought through some Part of the County of Southampton, or provided there: For Prevention whereof, the Lords and Commons in this present Parliament assembled, do hereby require the High Sheriff of the County of Southampton, and all Justices of Peace, Mayors, Constables, and all other his Majesty's Officers, within the said County, to be aiding and assisting in the Execution of this Order; and do hereby authorize the Deputy Lieutenants of the said County, or any One of them, Sir Henry Wallop Knight, Sir Henry Clerk, Knight, Sir John Compton Knight, Richard Gifford Esquire, Thomas Clark Esquire, John Kemp Esquire, John Hooke Esquire, Richard Mayor Esquire, Thomas Hussey Esquire, Thomas Chandler Esquire, Edward Goddard junior Esquire, Francis St. Barbe Esquire, Wm. Collins Esquire, James Nutt Esquire, Thomas Creswell of Heckfeild Esquire, Wm. Pawlett Esquire, John Miller Esquire, Francis Rivett Esquire, Nicolas Love Esquire, Wm. Bold Esquire, John Pitman Esquire, Wm. Carrick Esquire, Wm. Withers Esquire, John St. Barbe Esquire, Richard Love of Basing Esquire, Henry Kelsey Esquire, Thomas Hamburgh Esquire, Arthur Bromfeild Esquire, Thomas Betsworth Esquire, John King Esquire, Robert Knapton Esquire, Francis Palmes Gentleman, George Wither of Hale Gentleman, George Baynard Mayor of Basingstoke, and the rest of the Burgesses there, Robert Harwood Esquire, Richard Ashley Gentleman, George Venner of Goorely Esquire, Wm. Blake of Andover Gentleman, Wm. Jervis of Andover Gentleman, Wm. Cooper of Andover Gentleman, or any One of them, to make Stay of all Horses, Arms, Ammunition, Money, and other Provisions whatsoever, which they, or any of them, shall suspect to be preparing or carrying for the Making of War against the Parliament, as aforesaid. And whereas in the Store House at the City of Winton, in the said County, there are Six Field Pieces, with double Carriages, Nine Sows of Lead, Five dry Vats of Match, with Spoons, Ladles, and Brushes, and Iron Bullets for the Pieces; which said Pieces and Ammunition aforesaid are belonging to the said County of Southampton: And whereas it is not convenient for the Use and Service of the said County that those Pieces and Ammunition aforesaid should remain and continue in the said Store House: It is therefore Ordered, by the said Lords and Commons, That the said Pieces and Ammunition aforesaid shall be carried and conveyed into some more convenient Place of the said County, as the said Deputy Lieutenants, or any Two or more of them, shall nominate or appoint. Instructions to the Committee sent down from the House of Commons, to the Kentish Assizes. 1. YOU shall, upon your first Arrival, repair to the Judge's of Assize, and, in the Name of this House, acquaint him with the Contents of this Order and Instructions you have received from this House: And, in the Name of this House, to desire him to give you his best Aid and Assistance, in your Performance of the Commands of this House. 2. You shall acquaint the Justices of Peace at the Bench, and the Country there assembled, if you find Cause, with the Contents of the Order; and let them know, that, out of this House's tender Care and Affection to the Peace of that County, and this Kingdom, they have sent you down, with Order and Instructions, to use all lawful Ways and Means to preserve the said County, not only in Peace among themselves, but in a right Understanding of the Proceedings of Parliament; and do not doubt of your Readiness to comply with the Desires of this House herein. 3. You shall deliver to the Judge of Assize, an Order of the Lords and Commons, dated 20° Julii, 1642, concerning the Commissions of Array; and shall do your best Endeavour, by all Ways and Means, to hinder any Proceedings that shall be attempted in the Furthering the same Commission. And for your better Performance ... the Orders, Instructions and Commands, you herewith receive from this House, the Sheriff, Justices of Peace, Mayors,... Officers, are hereby required to be assistant to you in Execution and Performance of the said Orders and Instructions.